White Daisy Flower with Black Polka Dots all over. This clip is wrapped with a black grosgrain ribbon and is attached to an alligator clip. 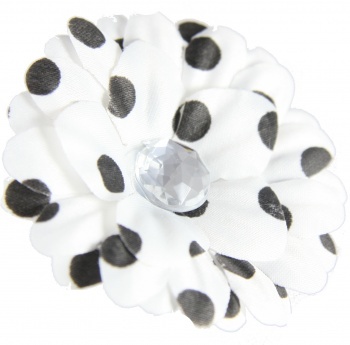 All you have to do is slide this right into the hair for a perfect polka dot daisy. The center has a white gemstone that really shines. This also looks great on black and white bows that have a flat center so the daisy clip can slide right on top and give you another whole look.